I spent my 2011/2012 Christmas and New Year’s vacation in Manila and Boracay Island in the Philippines. Sarita and I both have this weird emotional connection to Southeast Asia so when we’re there we feel like it’s our second home and spend our final days brainstorming business start-ups to keep us in the country. We haven’t been back in the region since our 2008 visit in Thailand so we were definitely looking forward to it. This was also the first time Rita really immersed me in her “street food foraging” style. Since my Semester at Sea days, I knew I had a stomach of steel and will try anything at least once, so I told her she could drag me around just about anywhere. We both drew the line when it came to the Filipino street food delicacy, balut – essentially, a fertilized duck embryo that is boiled and eaten in the shell. Yeah … we are way too classy for that. 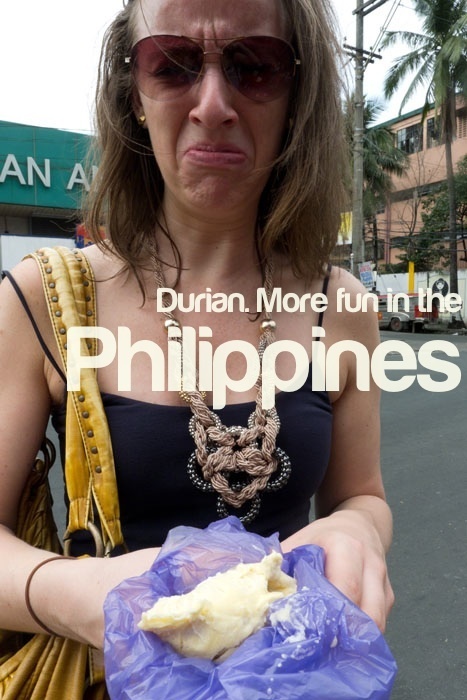 Yet somehow adventurous enough to sample some durian. Ya know, the least favorite food of Andrew Zimmern? The man who says he prefers balut over this fruit, and also consumes other stomach-churning fare like fried silk worm larvae and sautéed giraffe beetles. The timing couldn’t have been more perfect when I returned from my trip and while uploading photos I caught an article that mentioned the Philippines just launched a new tourism campaign which was catching fire on the internet, openly inviting people to create their own version of the ads. I wouldn’t be able start a blog any other way than talking about the identifying experience eight years ago that has really altered my whole perception on life: Semester at Sea. First I’d like to note that none of my travel excursions, including this one, would ever be possible without my best friend, mentor (and personal travel agent:) Sarita. I am an amateur traveler in comparison to her. She has always planned all of our trips from start to finish; I just have the luxury of taking in the glorious views and opening up my mind and heart to other cultures. Semester at Sea is a great option for those looking to travel abroad for various reasons: a) you have the opportunity to travel to multiple destinations instead of spending an entire semester in one country; b) SAS offers distinctive in-country itineraries to take the guess-work out of some of the planning (for people like me:)) and c) the SAS program truly embodies global education by concentrating on developing countries that can make a remarkable impact young college students. So, what are some of the things we’ve experienced in 100 days around the globe? An overnight stay at the dorm rooms at Peking University in Beijing and a mountainous hike up the Great Wall of China. Train rides throughout India from Chennai, New Delhi, Agra and Jaipur. While I mentally absorbed the breathtaking sights from the Taj Mahal to the Pink City of Jaipur, the socioeconomic disparities were an eye-opener to witness across the regions. The 2004 tsunami aftermath was still very prevalent and the battered city showed signs of struggle for many in Chennai. It was one of those places where I just stepped back and put my life in perspective, realizing how lucky I was to have my family and my health. One of my all-time favorite destinations was Angkor Wat in Cambodia. I have yet to catch a sunset or sunrise as beautiful from this ancient temple surrounded by nothing but a bright green jungle and almost completely untouched by western society. A 16-hour bus ride from Kenya to Tanzania to take a safari tour through the Serengeti and Ngorongoro Crater, and meet the Maasai warriors. Not something you get to do every day. Cycling and wine tasting through the wine regions of South Africa. Lounging on a hammock overlooking the bright stars of the southern hemisphere on a small boat in the middle of the Amazon river. Unfortunately, this was after the piranha fishing and alligator and anaconda hunting during the day which made it slightly difficult to fall asleep. I’m sure I will come back to elaborate on some of these individual experiences. In short, this is where it all began. This was my first chapter in travel. I was 20 years old, gone for 100 days, and when the MV Explorer docked back into the US port I knew my life would never be the same. You should also check out Sarita’s fabulous blog to read about all of her crazy adventures.